A quick post today to let you know about an upcoming and very exciting pattern collective I have been involved in. 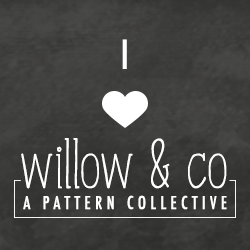 Willow and Co is a group of ten bloggers collaborating to create awesome pattern collections - the first of which will be launched early March, 2014. Due to many other commitments, I will not be contributing to the first collection but know it is going to be amazing and hope to contribute to collection two in mid year. that's great! I've already signed up!